Unlock your power and be yourself—you may just change the world! ANDREA PIPPINS is an illustrator, designer, and author who has a passion for creating images that reflect what she wants to see in art, media, and pop culture. Her vision is to empower people of color with tools and inspiration to create and tell their own stories. She is the best-selling creator of the coloring book I Love My Hair and the interactive journal Becoming Me. Her clients include O: The Oprah Magazine, Scoop Magazine, Family Circle, The Huffington Post, Bustle, Free People, Lincoln Center, and the National Museum of African American History and Culture. Andrea is based in Stockholm, Sweden. Follow @andreapippins on Instagram and visit her website at andreapippins.com. Jamia Wilson is the executive director and publisher of the Feminist Press. She is a leading voice on feminist and gender justice issues whose words have appeared in and on the New York Times, The Guardian, BBC News, The Today Show, CNN, The Washington Post, Elle, Teen Vogue, and more. 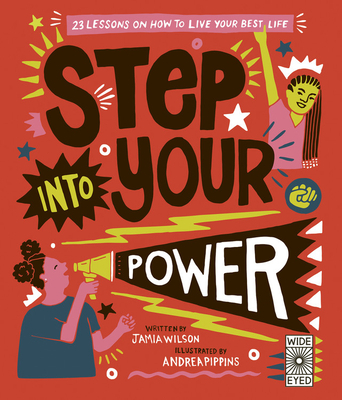 Jamia is the co-author of Road Map for Revolutionaries: Resistance, Activism, and Advocacy for All. She is also a columnist for Rookie Magazine and has contributed to several books such as Nasty Women: Feminism, Resistance, and Revolution. Jamia is an adjunct professor at the John Jay School for Criminal Justice and travels across the US—and beyond—to to talk about race, feminism, leadership, and so much more.